Local manufacturing businesses have returned from the Southern Manufacturing and Electronics show, the UK’s largest regional manufacturing technology, electronics and subcontracting exhibition. The event proved fruitful, with 115 enquiries received between the attending Fife businesses, which included: Contract Solutions Precision Engineering; AGS Electronics; Fife Fabrications; Reel Service; James C Gillespie Engineering; and Eurospray. Also taking part as a means of supporting collaboration and supply chain links with Fife businesses, was i4 Product Design. 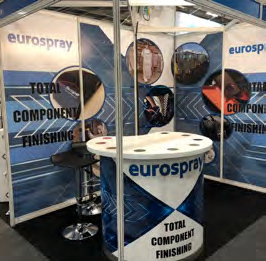 Eurospray’s Managing Director, Jim Fairnie, said: “This was our first time attending Southern Manufacturing, and we did so to showcase our paint finishing expertise to a wide range of sectors and industries. Fife Council Economic Development Team’s Trade Development Programme supported these local businesses to visit Southern Manufacturing.